The Dry is Jane Harper’s debut novel and is Little, Brown’s lead debut for 2017. Falk had watched the story on the news, seen the face of his childhood friend looking back at him from the front of every newspaper. Luke Hadler was dead. He’d shot his wife, his son and then turned the gun on himself. Falk was shaken by the news but time had passed since they were friends and he was trying to put his old home of Kiewarra behind him. But when Luke’s father calls, asking Falk for help, he can’t say no. Not just out of loyalty, but because the old man has been keeping a secret for both Falk and his son for a very long time. Every since a teenage girl’s body was pull from the river. Falk returns to Kiewarra, a small Australian farming town that hasn’t seen a drop of rain in two years. He left as a teenager, with the town snapping at his heels, blaming him for the death of his friend, Ellie. The town was already suffering in the drought, the murders dividing them in grief but Falk’s return united them in hate. As Falk investigates the deaths of the Hadler family he begins to see inconsistencies and questions he can’t walk away from. He knew Luke, knew he wasn’t always a good guy but was he really capable of murdering his family? The closer he gets to the truth, the more the town turns against him and the closer his own secret threatens to come to the surface. It only takes a handful of pages for Jane Harper to set the scene for a novel you won’t be able to pull yourself away from. The claustrophobia of the beautiful town of Kiewarra, a shocking family murder and buried secrets are all set out at an incredible pace that never lets up. Nothing in the small town is what it seems and every single character has their own secrets, old lies over the death of Ellie or newer secrets about the Hadler family. This combination of time frames adds to the intrigue, allows you to see the flaws in the characters and feel the ongoing tensions that living in a tight-knit, yet struggling community, brings. 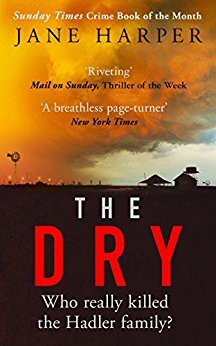 An incredible setting, fascinating characters and a plot that always keep you guessing makes The Dry a mind-blowing debut. Jane Hadler is definitely an author to watch and after devouring this novel in a couple of days, it’s easy to see why it’s been sold to twenty-two territories and had it’s film rights sold to Reece Witherspoon’s production company already. Get reading quickly because this novel is going to be huge!